Produktinformationen "Cryotubes 4.0 mL (sterile) - 5 x 100 tubes"
Cryo tubes specially designed for the storage of biological material down to -196°C (liquid nitrogen) to ensure a tight, leakproof seal even at lowest temperatures. 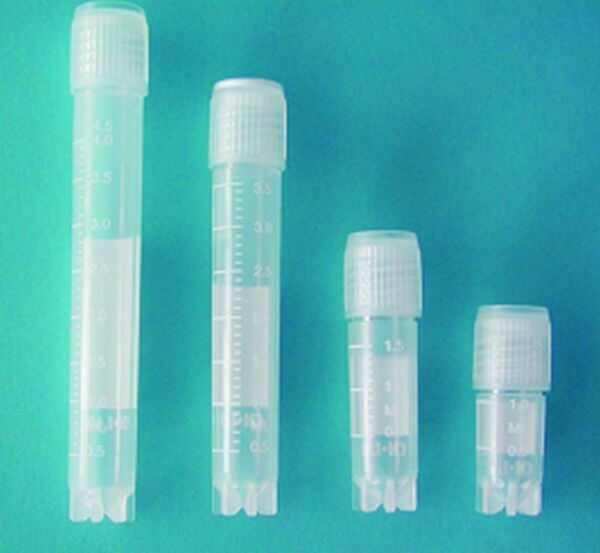 All vials are the standard 12.5mm diameter, and come in volumes from 1.2 to 5mL. For ease of identification, tubes have a white 'write-on' panel, and caps may be colour coded by a simple fitted and removable insert. These vials are sterilised by beta radiation and the 'free standing' variety feature locking bases to locate the tubes firmly into the rack. Vials are 'free-standing' (skirted). These sterile tubes/caps are packed in tamper-proof, resealable, safety-lock bags of 100. Weitere Artikel passend zu "Cryotubes 4.0 mL (sterile) - 5 x 100 tubes"
Unser Kommentar zu "Cryotubes 4.0 mL (sterile) - 5 x 100 tubes"
4.0 mL cryotubes. Sterile. Packed in 100 tubes per bag. Kundenbewertungen für "Cryotubes 4.0 mL (sterile) - 5 x 100 tubes"